If oranges and cherries aren’t quite your thing, you can replace the orange zest and dried cherries with other fruit, nuts, or other personal favorites (i.e. cherry pecan, blueberry almond, cinnamon date, or chocolate chunk). However, experiment to your heart’s content. 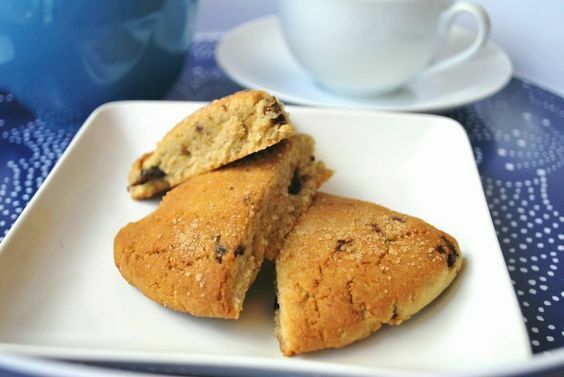 Keep in mind, though, these orange cherry scones pair particularly well with green tea or your favorite blend of coffee. Scones are best when straight out of the oven, so feel free to freeze some of your dough and save it for when you’re actually going to eat them. Just let them defrost before you bake them! Preheat oven to 400 degrees, then line a baking sheet with parchment paper and set aside. After that, combine the almond flour, coconut flour, baking soda, salt, and maple sugar in a food processor. Then pulse 2-3 times. Add in the coconut oil, maple syrup, and eggs. And then pulse 3-4 more times. Then add in the orange zest and cherries and pulse until well incorporated. Place the dough balls on the sheet of parchment paper on the baking sheet and press it down with your hands until you have a disk shape pressing the edges inward if they start to crack. Once you have 2 disks that are about 1/2 inch thick, then you can cut it into wedges like a pie, and sprinkle the tops with a little bit of maple sugar. Finally, bake about 15–20 minutes, until scones are light golden brown along the edges.